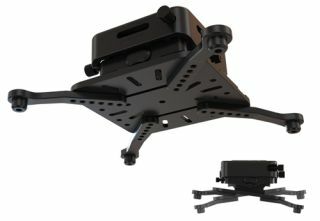 Crimson AV is now shipping their new series of JR series projector mount solutions. The new JR Series includes three mounts with varying features and competitive pricing that are designed for Residential and Commercial applications including Corporate, Higher Education, K-12, Hospitality, Worship, Venues, Arena, Bars, and Restaurants. Lightweight and easy to handle, the Crimson JR basic projector mount features two points of adjustment for both pitch and roll, which simplifies the alignment of projectors weighing less than 50lb. A pre-assembled two-piece design with integrated cord management and 1.5” NPT compatibility enables pre-wiring for a quick and easy installation. A universal design facilitates hole patterns up to 380mm diameter and a quick release mechanism allows easy removal for projector bulb replacement without losing preset picture adjustments. The Crimson JR2 is a mid-level two-piece projector mount that features heavy-duty all steel construction in a low profile, pre-assembled package. Twelve adjustment points are included; six for pitch and six for roll to ensure that even heavier projectors or those mounted off-center of gravity stay in place without slipping after installation. A universal design fits hole patterns up to 460mm diameter and a click-in-place quick release allows removal for projector bulb replacement without losing preset picture adjustments. Crimson’s JR3 SyncPro features a lead screw mechanism to ensure precise adjustments; simply rotate the large, easy to grip knobs to make all necessary adjustments during installation. Heavy-duty construction makes JR3 SyncPro useful for larger projectors and/or those with an off-center lens, and a universal design fits hole patterns up to 380mm diameter. Additional legs expand the range to cover any large or irregular mounting hole patterns, and a quick release mechanism enables removal for projector bulb replacement without losing preset picture adjustments.